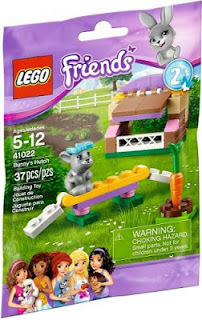 In our final of three of the second series of the Friends animal polybags we look at a rabbit redux. My builds are usually accompanied by my two 6 and 5 year old FCFOLs. This time the 6 year old was so sick she didn't care to participate so I let the 5 year old build this one on her own. Usually she just prefers to play with the pieces and not explicitly follow the instructions. But I thought I'd see how well she could do. So all by herself she built the thing missing only two pieces. Very impressed I was. After that though she didn't do much with it. She moved the bunny around a little bit but I was surprised that she didn't feed him/her/it the carrot and put it to bed. The set is sort of a half-sized version of Andrea's Bunny House without the mini-doll. I bought several of those sets that were being clearanced out for picking and parting. My little girls were rather excited with the pink and the fences that I gave them a handful of parts in exchange for helping me sort pieces. I'm not a little girl which would probably explain why this set looks like a color warrior designed it. But I suppose the cheery inclusion of all the colors is a purposeful move to get the target audience to enjoy the set. This set in particular seems to have a higher percentage of neutrals than any of the other animal polybags. Especially of interest is the 2x3 clip tiles in medium dark flesh. LEGO has been slowly leaking parts out in this color, and not quite fast enough in my opinion. Eighty-eight pieces over three years as opposed to the massive influx of Olive Green within a year. The set comes with 6 brick bricks (sadly no extra), and some tan arches and 1x2 travis bricks. If you are a castle and landscape builder it might be a nice parts pack. I say castle because grey castles are so last decade. The castles that the kids are building these days are all sorts of earth tones. As with series one you can follow the links in the instruction book to build some sort of mega play area for your hedgehog/poodle/rabbit friends. Or maybe it's a temple to honor the poodle, I dunno. 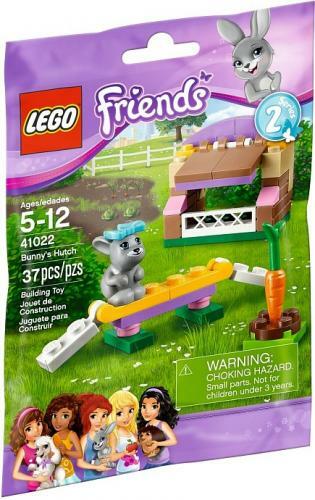 You can pick up Bunny's Hutch from LEGO for $4.99.